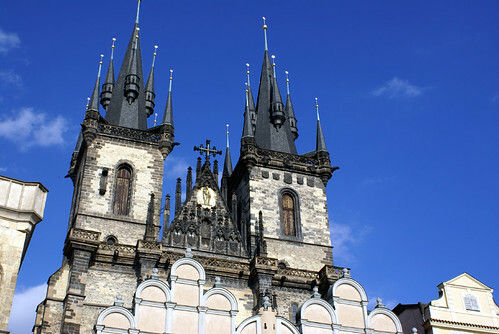 Church of Our Lady Before Tyn - Prague, Czech Republic, a photo by Craig Grobler on Flickr. Prague's city centre is made up of 4 districts, spanning both banks of the Vltava River. On one side is the Old Town (Stare Mesto) with the Old Town Square; the New Town (Nove Mesto) with Wenceslas Square; and, the Jewish Quarter (Josefov). On the other bank is the Lesser Quarter (Mala Strana) with Prague Castle. The city centre is the Old Town Square which is surrounded by incredible ancient spired buildings on each side. The Old Town Square (Staromestske Namesti) has been around for 600 to 700 years. Over the next few centuries, many buildings of Romanesque, Baroque and Gothic styles were erected around the market. Sights to see include: the Church of Our Lady before Tyn, the Old Town Hall Tower, Astronomical Clock and the stunning St. Nicholas Church.